In a Nutshell: Connex Credit Union’s Coins-for-Change program takes the fees charged by its coin-cashing machines and donates them to nonprofit organizations in the four counties Connex serves. The popular program is part of a larger charitable and philanthropic initiative known as ConnexCares. In addition to Coins-for-Change, ConnexCares gives back to the community by hosting financial seminars, offering scholarships, promoting volunteerism, and through various other fundraising efforts. This philosophy of helping people is not limited to ConnexCares — it is at the credit union’s core mission in its everyday practices. 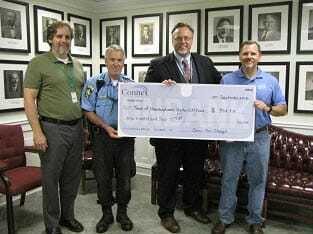 Hamden, Connecticut, Mayor Curt Balzano Leng smiled for the camera as he held an oversized check for nearly $1,000 recently. Leng was on hand to represent Hamden and its efforts to fund its own animal shelter following a citizen-led initiative to help abandoned and abused animals in the area. 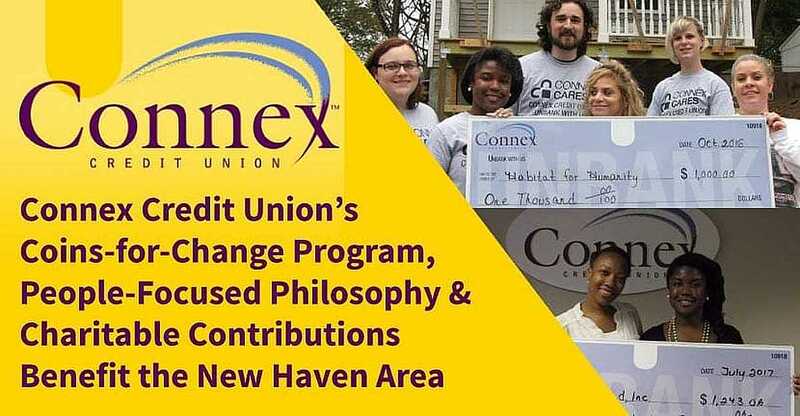 Those large checks are becoming more popular around the New Haven area these days as the word is spreading about Connex Credit Union’s Coins-for-Change program. Hamden’s Animal Shelter fund, along with three other regional nonprofits, are just the latest beneficiaries of Coins-for-Change program that raises around $13,000 a year through the modest fees it charges at its coin-cashing machines across various branches. Hamden, Connecticut, Mayor Curt Balzano Leng accepts a check from Connex Credit Union. Connex Credit Union has been active in the greater New Haven community since 1940, when it was founded as the New Haven Telephone Employees Federal Credit Union, initially serving employees of the Southern New England Telecommunications and their families, according to the Connex website. The credit union was able to expand its membership eligibility to employees of around 450 additional companies and organizations during the ‘90s. The current iteration of Connex Credit Union was born in 2003 when it converted to a state-chartered credit union. The organization is now open to anyone who lives, works, attends school or worships in New Haven, Hartford, Middlesex or Fairfield Counties. These days, Connex bills itself as the “Unbank,” and serves more than 55,000 members across eight branches in the greater New Haven area. The machines are located in the Guilford, North Haven, Hamden, and Monroe branches. Then, one machine is dedicated to the pre-selected organization for the quarter. Johnson said they try to choose an organization close to the particular branch where the machine is located. 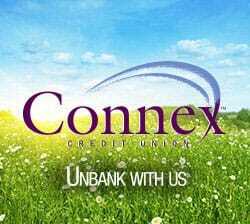 The organizations are selected by a committee comprising various members of Connex Credit Union. The pool of organizations to choose from comes from a combination of nonprofits nominated by Connex employees and applications from the organizations themselves, Johnson said. The coin-cashing machines charge a 5% fee to Connex members and 7% to non-members, and Connex Credit Union donates 100% of the money raised by the fees to the chosen nonprofits. Connex maintains a rolling list of organizations that have not been previously selected, with the addition of any new organizations up for consideration. Johnson said she can tell the program is becoming more popular because it receives more unsolicited applications from nonprofits than it used to. And Connex patrons are noticing the program more as well. She said several years ago, Coins-for-Change was raising around $10,000 a year on average, but the last couple of years that number has been averaging around $13,000. Besides the Hamden Animal Shelter Fund, other recent beneficiaries of the Coins-for-Change program include Integrated Refugee and Immigrant Services, the North Haven Historical Society, and Woman, I Am, Inc. The summer months often see some of the highest numbers of people cashing in their coins, Johnson said, because they want to wrangle some extra funds to help with their vacation budgets. “It’s so funny when you hear the machines going because it sounds like a gushing waterfall,” Johnson said. Johnson said Coins-for-Change is just one facet of Connex Credit Union’s overarching philanthropic and charitable arm called ConnexCares. She said the program’s goal is to promote financial literacy, well-being, and understanding in general to the communities Connex serves. “We have financial workshops we do throughout the year that are open to the community, not just our members,” she said. Connex is involved in other local activities and programs as well, including Habitat for Humanity and the annual Shamrock & Roll 5k, on which it serves as a primary sponsor each March. Johnson said the credit union also gives out three different scholarships each spring. One of the scholarships is dedicated to students who have shown a commitment to community service, and another is designated to specifically support business students, according to the Connex website. Connex employees volunteer at a recent Habitat for Humanity event. 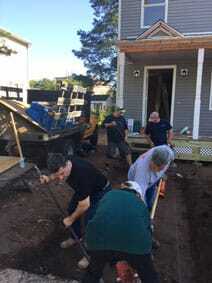 Johnson said about 10 Connex employees band together each year to volunteer for Habitat for Humanity. “It makes us feel really good that we can actually be a part of the construction, the painting — whatever it may be — to help a family that may not have had the opportunity to have a home,” she said. Johnson said the future homeowners are often on-site, and it’s a great chance to really get involved on a personal level. Connex holds a holiday charity drive each year as well. Johnson said past drives have involved collecting items for local homeless shelters, coats for children, or care packages for low-income families. As far as financial literacy, Johnson said they hold a number of workshops throughout the spring, fall and winter. Some of the workshop topics include building and maintaining good credit and a tutorial for first-time homebuyers. Another popular program is the budgeting workshop. “We initially thought maybe younger people who are just getting started with cultivating good financial habits would be interested, but we have seen a lot of seniors attending that workshop,” she said. Johnson said Connex recently added the option to view the workshops online as well, which has garnered positive feedback from members. According to its website, Connex strives to be recognized as a leader for customer advocacy and providing a positive customer experience. This includes a commitment to working in the member’s interest, understanding members’ goals, helping to identify roadblocks and provide solutions to financial needs, and being responsive so members receive a friendly, simple and fast experience. Connex offers members a full range of banking services and options, including savings accounts, checking accounts, a broad offering of loans, and even youth accounts. The Connex website also offers a number of resources for members, including financial tips and videos, financial calculators, and a guide to financial definitions. Its eight branches are located in Branford, Guilford, Hamden, Meriden, Monroe, New Haven, Orange, and North Haven, where its headquarters are located. Connex recently selected its list of organizaitons to receive one of those oversized checks: D.A.R.E., Adam’s House, Circle of Care, and the New Haven YMCA Youth Center. Nonprofits in the region hope New Haven-area residents will be cashing in their coins well beyond the holiday season, and help provide gifts that can go much further than any store-bought item.